Sheltered By the Millionaire is the second story in this continuity series - a series written by various authors. Although it is obvious there are certain storylines that would be addressed in different books, this story does stand on its own. Rich, powerful, and able to prove money does the loudest talking, Whit Daltry had been Megan Maguire's nemesis since she arrived in Royal, Texas. Her primary concern in life was her daughter Evie, especially when a tornado rips through town. As she tries to cross town to her, she is reminded of when she tried to open her animal shelter close to Evie's daycare, Whit had opposed her efforts, and succeeded. Suddenly, it is Whit himself who comes to her aid and is able to get Megan to Evie quickly, and safely. Whit found himself interested in Megan, but she clearly held the past against him. When he rescues a cat, he immediately thinks of her and takes the cat to the shelter, only to once again fail in her eyes. He has no experience with cats, and doesn't want one. Shouldn't the fact that he rescued the cat have any merit? With the aftereffects of the tornado, and Whit's volunteering to fly animals to other shelters, Whit and Megan are able to spend time together, and see that their chemistry does not wane. But the question remains if Megan would be able to accept the fundamental differences they have. 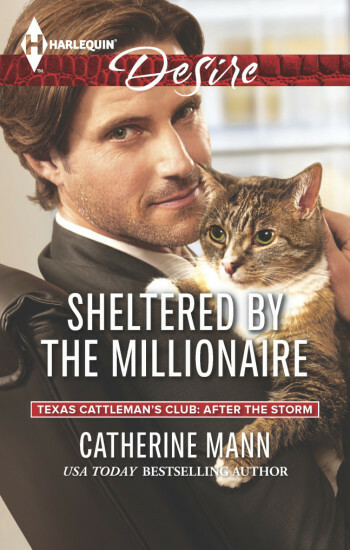 Sheltered By the Millionaire is an opposites attract with sparks flying romance. Megan rescues animals, recycles, and saves the natural habitat. Whit, well, doesn't. Or rather, he will help animals, but not so much on the other issues. Unfortunately for him, these are almost make or break items for Megan, so Whit has to pull out all the stops to prove that although they may differ on certain issues, at their core, they match.